The season has come to an end. And no, I'm not talking about summer - I'm talking about our first season as blueberry farm owners and operators! It was a hot, fun, sweaty and exciting one. Up until about a month before the season was to start and the farm was to open, we didn't know we'd be running the farm this year. But, lo and behold, it was time. Time for us to take the torch and carry on. Time for us to put up a tent and a table. Time for us to discover what it felt like to be farmers (I use farmers loosely...). And it went without a hitch. The berries started out plump and plentiful. They stayed that way for about six hours. Yep, you read that right! Those puppies were picked at the speed of lightning. So many folks came out and we were overwhelmed by all of the faithful berry pickers that have loved and cherished the farm for many, many years. Some even knew my grandma. It was amazing! And those funny little chickens were a hit! 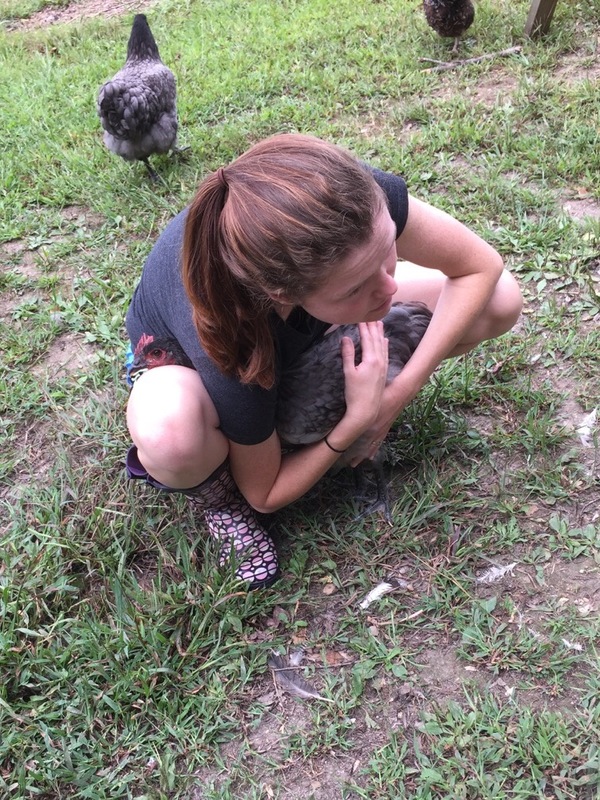 *Side note here: this is my cuddliest chicken. She was so sweet and would come up and nuzzle me to love on her. I'd always oblige and we were buddies. But then..."she" turned out to be a "he" and stopped being cuddly and started being a pain. So now, let's just remember the good ol' days when Ellie was a girl and not an obnoxious, in-your-way-ALWAYS rooster. Seriously though, we had so much fun with those sweet, fuzzy, dirty ol' chickens! Then we'd pick and eat those delicious blueberries and we were happy. And isn't that was it's all about? I do think so. So, until next summer, friends...eat, drink, and love on some chickens!